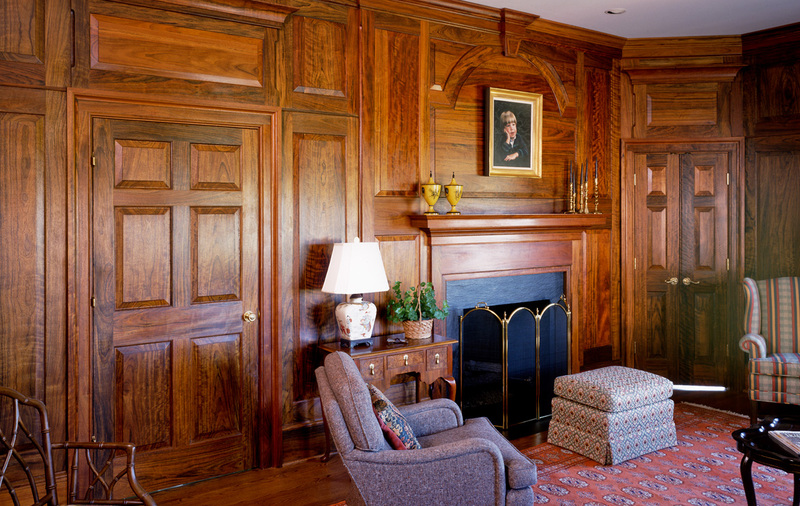 As custom cabinetmakers, we focus on design and craftsmanship, but are always in touch with the wood, and its inherent capacity to imbue a room with its particular character. A wood’s color can make a room feel cool or warm. A wood’s density determines its surface’s reflective qualities, and the way it redistributes light. A wood’s grain and figure display engaging patterns and accents. The endless variations move us, and speak directly to our clients’ desires. Jaeger and Ernst can work with any of the hundreds of wood species available. This solid African Shedua is a warm, dense, lustrous hardwood. It is suitable for traditional work, and equally adaptable to contemporary designs. When you commission a custom designed room from Jaeger and Ernst, you can be assured that the finished space will reflect our extensive knowledge of wood, our commitment to fine design, and our years of experience in custom woodworking.